Laroche had been born Elise Raymonde Deroche in France in 1882. 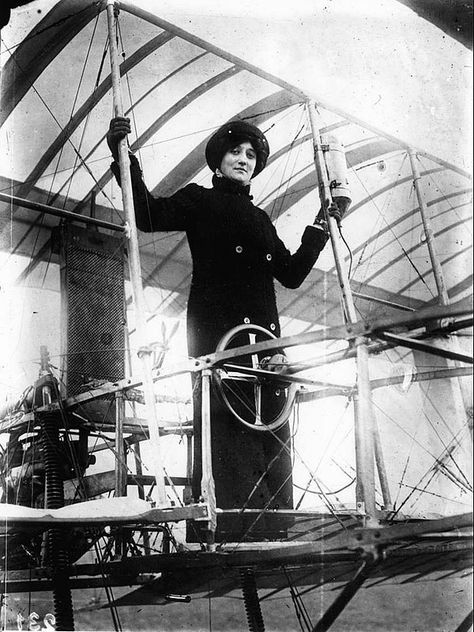 Despite the accomplishments of the Wright Brothers, the fervor over the new aeronautical industry was in Europe, not North America, and Laroche took her keen interest in the new sport to Chalons, east of Paris, where she undertook training. When she made her first flight, it was a solo flight as the crude airplane could only fit the pilot. Although legally able to fly, La Roche was not permitted to fly for France duringWorld War I and instead drove officers to and from the front, often under fire. Obviously, flying was a dangerous activity in those early years, and Laroche had been seriously injured in a plane crash in 1910 and again in an automobile crash in 1912. Not dismayed, she continued her flying and after the war, she picked up where she had left off, becoming a test pilot. During that time, she achieved some records for altitude and distance flying. Unfortunately, her career came to a quick and early end in 1919 when an experimental airplane she was either flying or flying in crashed, killing both her and the other pilot.